Created by us. Designed by you. Before we embarked on our brand new development of 20 state of the art Executive Rooms, we listened very carefully to our customers. You wanted ultimate comfort. We delivered luxurious beds, individually controlled air conditioning, and sparkling modern bathrooms, along with monsoon walk-in showers in most of the rooms. You wanted modern convenience. We supplied USB charging points for your mobile, your own fridge and secure laptop safe, plus the latest telephone switchboard system. You wanted great entertainment in your room. We provided 40” plasma TVs with Sky including all seven Sky Sports channels. 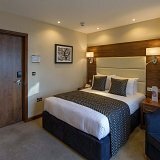 Come and experience the Executive Rooms that are setting a new standard for Exeter hotels.